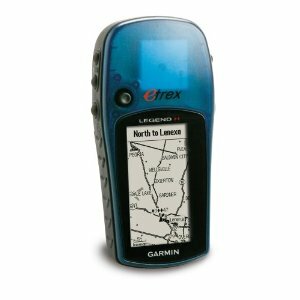 The Legend includes a World Base Map display and 8 MB of memory, allowing you to load detailed topo or city detail maps from Garmins MapSource series. Note that unless your computer has a serial interface, you’ll need to purchase a serial-USB adapter which can be found for less than 10 bucks (see Accessories below). The built-in base map of the Americas displays city and interstate highway information for North, South, and Central America, as well as U.S. highway exits, points of interest along lakes, rivers, and coastlines. The Legend has a front-panel rocker switch for map panning. Though it doesn’t have a color display, its monochrome LCD has very readable resolution of 288 x 160 pixels. You’ll find the Legend to be a rugged companion — it’s waterproof and will handily survive submersion.